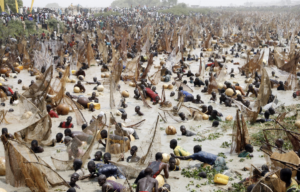 Arugungu fishing festival – a fo ur day festival organized annu­ally in Nigeria’s North Western Kebbi State. It derives its name from the town, which is host to the festival. It was started in 1934 to mark the end of hostilities between old traditional rivals: the Sokoto Caliphate and Kebbi Kingdom. Eyo fe stival – held in Lagos, Nigeria’s commercial nerve center. It is said to be a prelude to the famous Brazilian carnival. During the festival, Eyo masquerades come out to perform and individ­uals who come to watch are prohibited from wearing hats. Yam festivals – these are also popular in Ghana. They are held in various communities across the country. They vary in si ze and significance from place to place. They signify the harvest of yams. And in certain communities, it is a taboo to consume yams-a local staple-before the festival. 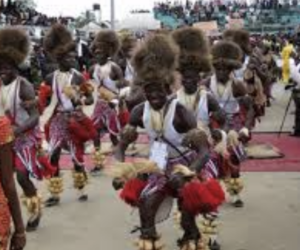 The popular yam festi­vals are held in the south eastern Nigerian states of Cross River, Enugu. During the period, yams are first sacrificed to local deities as thanksgiving before people can consume them. 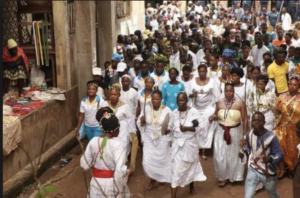 Osun festival – held in Nigeria’s South Western Osun State. It is a festival in honor of Oshun, the river goddess, an important Yoruba deity. Usually a week long, sacrifices are offered to the deity for protection and is watched by thousands of tourists. 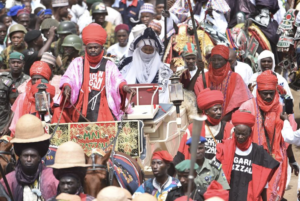 Various Durbars held in Northern Nige­rian cities like Kano, Katsina, Zaria, etc. during the various Muslim festivals. It is a traditional horse riding ceremony which entails paying homage to traditional Emirs. In ancient times, durbars are organized to enable potential recruits in the military to show their horse riding skills. Christmas lighting – organized throughout December of every in all States of Nigeria. It usually starts from end of November to mark the begin­ning of the Christmas season. It includes showcasing several plays, songs and oth­er events climaxing in fireworks to usher in Christmas celebrations. Calabar carnival- tagged as Africa’s larg­est street party. It’s held on December 27th every year in Calabar, the serene capital of Nigeria’s Cross River State. The carni- val-probably Nigertia’s biggest-attracts tourists from all over the world. It is fash­ioned after the Brazilian carnival. It sports street dancing and displays by fancifully costumed performers, showcasing up to 50,000 performers. It highlights a month end celebration of the Christmas season. Abuja festival- organized annually in the nation’s capital. It showcases cultur­al troops from the various communities around the country. Usually a week long, it also attracts tourists from all over the world as they watch beautiful and rich cultural displays from across the country. It is an opportunity to see the whole of Nigeria in one place. 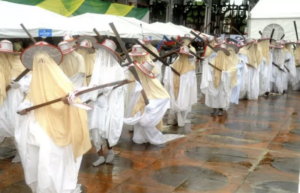 Eggon Carnival – organized b y the cul­turally rich Eggon people of North Central Nigeria. It’s held during the Easter cele­brations. It showcases one of the richest and oldest cultural traditions in the country. Various wonderful cultural displays includ­ing artifacts of the proud Eggon people. Visitors from across the world come to be a part of the annua major international event.